"Tell Her No" is a hit single written by Rod Argent and included by English rock band The Zombies on their eponymous debut album The Zombies in 1965. It peaked at No. 6 on the Billboard Hot 100 chart in the United States in March 1965 and was one of three big American hits by The Zombies (the others being "She's Not There", in 1964, and "Time of the Season", in 1969). 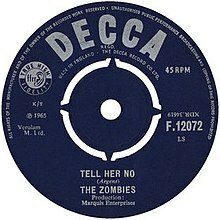 "Tell Her No" was only a minor hit for The Zombies in their native Britain, where it peaked at No. 42 on the UK Singles Chart in February 1965. In 1983, Juice Newton scored a Billboard Top 40 hit in the United States with her version of the song. In 1983, country-pop singer Juice Newton remade "Tell Her No". Newton's version reached No. 14 on the US Billboard Hot Adult Contemporary singles chart and No. 27 on the US Billboard Hot 100 chart. Newton changed the song's lyrical gender and point of view, which significantly altered the song's meaning, now being about a woman convincing her man to resist the temptations of a potential adulteress. Del Shannon also covered the song. Tahiti 80 covered the song in concert. More recently, the band Tennis also recorded a cover as a single in 2011. ^ a b c d Planer, Lindsay. "Tell Her No". Allmusic. Retrieved 2017-01-26. ^ DeCurtis, Anthony; Henke, James; George-Warren, Holly, eds. (1992). The Rolling Stone Illustrated History of Rock and Roll. Random House. p. 206. ISBN 0-679-73728-6. ^ a b Dean, Maury (2003). Rock 'n' Roll Gold Rush. Algora Publishing. pp. 184, 296–297. ISBN 9780875862071. ^ a b Michael Gallucci. "5 Reasons the Zombies Should Be in the Hall of Fame". Ultimate Classic Rock. Retrieved 2017-01-26. ^ a b Righi, Len (August 13, 2007). "Colin Blunstone's voice reanimates the Zombies". Pop Matters. Retrieved 2017-01-26. ^ "Dirty Looks". Allmusic. Retrieved 2017-01-26. ^ McCormick, Moira (October 21, 2000). "Tahiti 80's Heartbeat Catches Ears". Billboard Magazine. p. 11. Retrieved 2017-01-26. This page was last edited on 13 April 2019, at 02:41 (UTC).